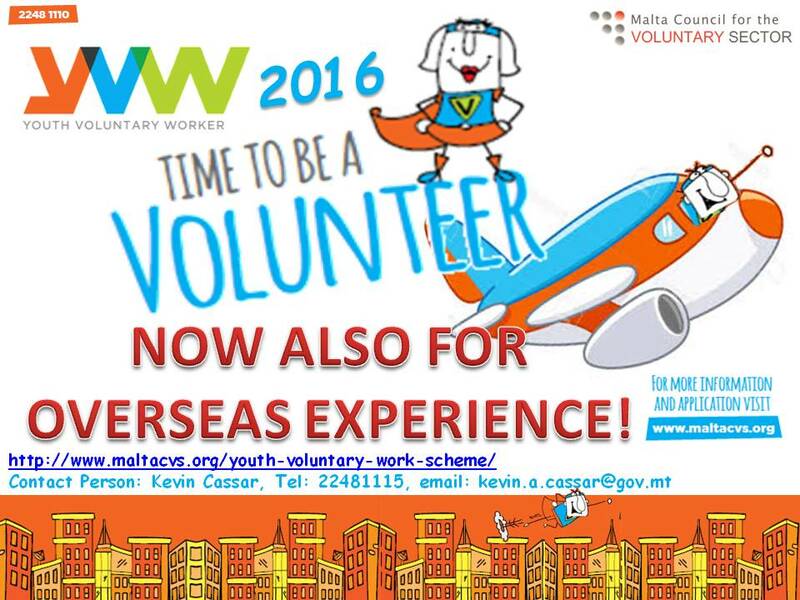 The Youth Voluntary Work Scheme (YVWS) has now been up and running for the last year, addressing two main goals. The first goal is to help young people improve their skills and employment prospects by giving them an opportunity to take up volunteering as part of their non-formal and informal learning process. It will also enable them to discover the value of voluntary service and helps to foster a sense of community and active citizenship. The second goal of the scheme is to support Voluntary Organisations in attracting young people to volunteering, enabling them to enhance their capacity with new volunteers and fresh ideas. 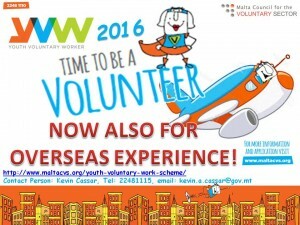 To enhance these goals, as from this year the YVWS will also be supporting voluntary experience abroad for young people through locally registered voluntary organisations to carry out international volunteer service in Europe, Africa, Asia, Australia and South America. Those interested or wish to have more information please contact Mr. Kevin Cassar on tel:22481115 or email kevin.a.cassar@gov.mt. VOPS RESULTS – 2016Training Initiatives Scheme 2016 – Coming Out Soon!